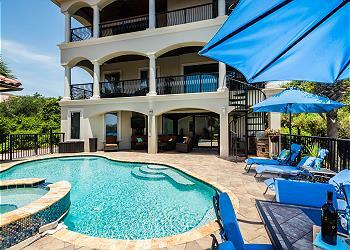 LOCATION: This home is 60 feet away from the beach access. DETAILS: The first floor of this home is ideal for many guests! This floor includes one king bedroom with ensuite shower, and one bedroom with two full over full bunk beds with gulf views. This floor also includes a media room and convenient kitchenette. Just outside the double doors to the spectaculars outdoor living space, you will find a private pool, hot tub, paddle boards and phenomenal gulf views. Walk up stairs to see the second floor where you will witness even more spectacular views! The massive porch can be accessed from this open living space. This home includes a gourmet kitchen, huge dining table and comfortable living space. Down the hall you will find two king guest bedrooms with ensuite bathrooms boasting gorgeous natural light. The master suite is found on the third floor. This massive space includes a huge ensuite bathroom with flat screen TV, private deck looking over the Emerald Coast, and a plush king bed! The fourth bedroom is just down the hall and also includes a king bed and ensuite bath equipped with a tub and a TV. 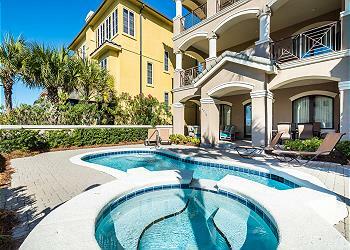 AMENITIES INCLUDE: 6 adult bikes provided, gulf views, beach access. This property comes with 3 dedicated parking spots. Complete Clean Linen Participant - ALL linens, including comforters laundered upon every checkout. This is our 4th year! We absolutely LOVE it here! It’s always clean, beautiful and welcoming with so many great extras! Another wonderful spring vacation for us! Was our first time booking with 360 Blue Property Management we’re very pleased with everything, we had a issue and Morgan Savant was very helpful. The house was cleaned, comfortable, well maintained and in a very good location. The only thing was we couldn’t watch anything in any tv apparently the signal was off( maybe cause of the heavy rain we experienced all days). We are so delighted that you enjoyed your vacation and experience with us in Destin! We apologize for the issues experienced but we are very glad to hear that we were able to correct it for you in a timely and professional manner. Thank you for staying with 360 Blue, we look forward to hosting you all again soon! Our family enjoyed a wonderful vacation at the Caribbean Cabana in Destiny by the Sea. This was our first experience with 360 Blue and we very much enjoyed this vacation and the interaction with 360 Blue. They were very responsive to a few minor issues. The property was well maintained and exceptional in the size of the kitchen and family area, the pool, the access to the beach. Our family had a wonderful experience and are planning to come back to this property for next year. Thanks 360 Blue! We are so glad that you and your family had a wonderful vacation and a great experience with us at 360 Blue! 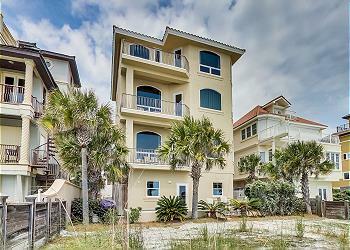 We agree that this home is a wonderful option for a fun-filled beach getaway and is so accommodating! We hope to see you again very soon!